The iSlider travels exceptionally well, fitting in even the smallest of bags. It comes with its own pouch and the design allows for a variety of devices to be used with it. I’ve used my iPad and iPhone with it (although using the latter isn’t practical for most use cases), and it’s the only stand that has stood up to my heavy touchscreen typing. The design is such that the iPad is incredibly stable and the angle can be easily adjust for viewing or typing. The iPad can be placed in horizontal or vertical orientation, meaning it’s also a solid stand for reading. I’ve written more extensively on my iPad with The iSlider than I have with the ZAGGmate and my external Apple keyboard. I’ve become more proficient with my touchscreen typing as a result, which is an unexpected (but welcome) side effect. The iSlider may not be ideal for use on your lap or on other soft surfaces, but it’s perfect for airplane tray tables and coffee shop counters. Its low profile and compact design stays out of your way so you can use your iPad (or other tablet) with ease. 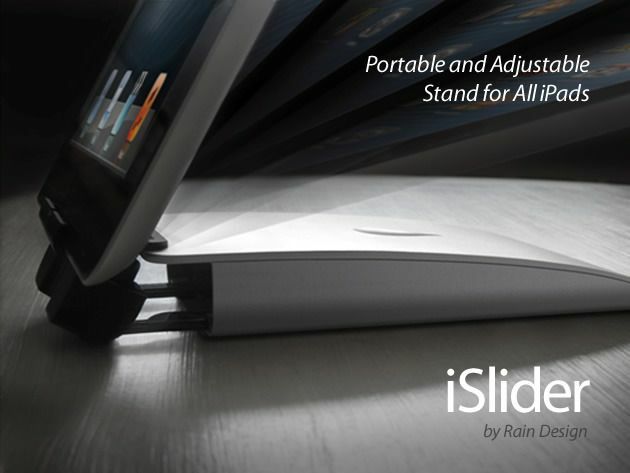 If you want to get the kind of quality stand that Rain Design is known for — sleek, well-made, and versatile — then get yourself an iSlider. Take advantage of the 20% savings being offered on this iPad stand through Cult of Mac Deals while you can. You won’t regret it.